I caught the bouquet. Now what? You see, I’m four for four. I’ve caught four bouquets at four weddings. First time: my friends Heidi and Cole were married. She flung the bouquet, an exquisite arrangement of white roses, orchids and ivy. It fell toward the hands of her sister. I batted it out of the air, and it was in my clutches. Later that evening, I pulled a rose out of it and tangoed around the dance floor with it in my teeth. I hadn’t had a drop, I swear. Well! The next summer, it was her sister, who’s grasping fingers I took the bouquet from, who was married. So, I stood among the single ladies on the lawn outside the church. The bride rose up on the wooden railing and flung her gerbera daisies and wildflowers over her shoulder. It fell toward her sister-in-law. I leapt in front and seized the smashed posy from midair. Guess who got married on Valentines Day? The sister-in-law. I was beginning to think I was some sort of good luck charm. Third wedding, I didn’t have to fight anyone–it was a fair catch. But a two of the friends I came with got married the next spring–to each other. Actually, I think all the friends I travelled with are now married except for me. What the heck? My coworker got married this weekend. There she was, a beautiful china doll with her big blue eyes and pearly gown. And there I was among the single ladies. They were TALL single ladies, but I was pretty sure I could manage, so I put myself right out in front. The bunch of cala lilies went up up up. They soared toward a chick in a yellow dress. What happens next is rather blurry. Somehow the chick in the yellow dress, bouquet in her hands, ended up sprawled on the floor and I came up with the flowers. You’re welcome, chick in the yellow dress. Invite me to your wedding. I’ll probably catch your bouquet too. Maybe your just a good catcher??? 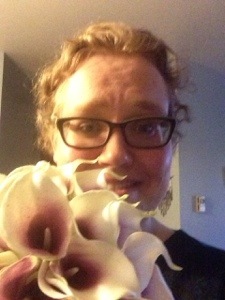 I was at a wedding once where the bouquet hit me in the face… I’ve always wondered what THAT meant. lol. Ooh, good question. Any strange events follow?